When the calendar rolls around to September, it’s time to head to Krannert Center for one of the biggest can’t-be-missed moments in the community—the Opening Night Party. And this year, we’re not just opening the season, we’re celebrating the University of Illinois’ Sesquicentennial and ELLNORA | The Guitar Festival 2017! Get ready to revel with a stage-to-stage lineup of incredible artists, plenty of all-ages amenities, seriously tasty options in the food tent, and a spark of six-stringed exhilaration to set the whole season aglow. We’re kicking things off with Matt Stewart performing the national anthem, followed by the James Jones Trio, who hail from just down the road in Danville, Illinois, and serve up traditional blues with modern inflections. Samantha Fish, heralded by ELLNORA alumni like Buddy Guy and Luther Dickinson, is a Kansas City-born Blues Music Award winner known for her commanding voice and penchant for writing and covering songs that rock. 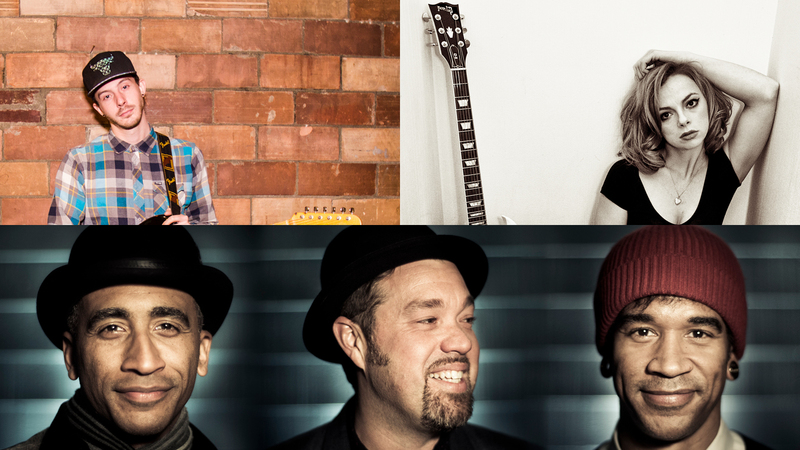 And after nearly two decades of making music together, the jubilant trio of artists that comprise Soulive—guitarist Eric Krasno and brothers Neal (Hammond B-3 organ) and Alan (drums) Evans—know a thing or two about igniting a party from the stage. Whether they’re collaborating with John Scofield, Derek Trucks, Joshua Redman, or Robert Randolph, their grooves never quit, the solos are always soulful, and the surging funk rhythms give the green light on good times. 8:30pm, Jose Emilio Gobbo Jr. Try your hand at guitar pick jewelry-making or screen printing with Weiskamp, stop by the Studio Theatre for a showcase of mini-performances, shop festival merchandise at the ELLNORA Store at Promenade, visit the four-panel guitar mural on the terrace and Bubble Man in the Amphitheatre, marvel at the community guitar gallery hung throughout the Lobby, help your little patron revel at the Koester & Bradley craft area, and be sure to recharge with delicious food options in the tent including Siam Terrace, Rick’s Bakery, El Oasis, Caribbean Grill, Piato, Fired!/Smoked, and Jet's Pizza! Download the menu. All ages are welcome. Kids under 5 years of age receive free admission; a complimentary ticket is required. Download the ELLNORA 2017 mobile app on iTunes or Google Play for the latest festival updates!